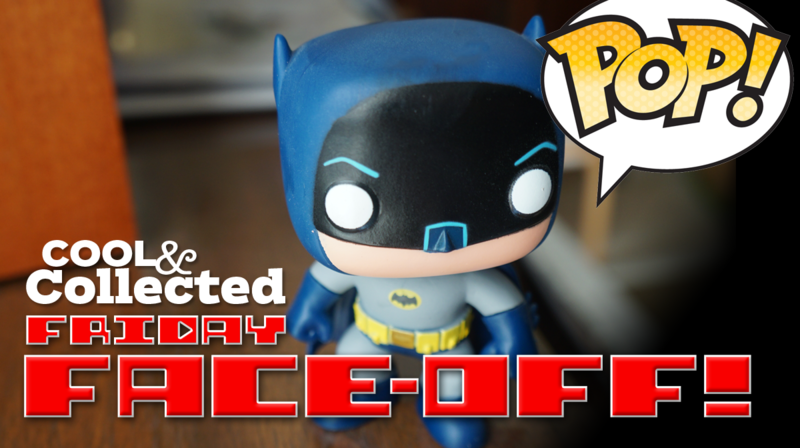 Welcome to a new feature here on Cool & Collected: Friday Face-Off! Each week, I’ll post a topic and see if we can get a friendly debate going. Please no biting, kicking, or hitting below the belt — let’s keep things civil. To start things off, let’s discuss those ubiquitous pieces of plastic that can be found on store shelves everywhere — Funko Pop! vinyl figures. Love /em or leave ’em? Add your comments below. Sigh, I really like a lot of aspects about Pops, but hate a lot of others. Love: Affordable Vinyl Toys, Some fun obscure licenses, pretty decent design. I actually love that they have all those licenses — as long as they aren’t exclusive licenses. Reminding people about these old characters and entertainers is a good thing in my book. I would never buy a Lemmy Kilmister Pop! but I like that it’s available for those who would. Funko and I have some issues. As someone who has just sold off his entire POP collection I have a hard time justifying the existence of POPs in their current form. My biggest gripe is the fact that Funko is utilizing the “retirement” marketing gimmick ala Beanie Babies. Is it exactly the same? No, it’s not 1999 anymore but the same basic issues are present. Perennial favorites such as He-Man, Skeletor, Bebop, and Rocksteady are taken off the market allowing the aftermarket to charge obscene amounts. Funko relies on established characters rather than animals to fuel their fanbase. Now don’t get me wrong I understand that characters cannot remain in stock forever, but on the other hand key characters should be lasting options to purchase. The 4 turtles are still being stocked, so why not He-Man? My final thought on POPs is simply they lack, for me, any sort of fun. their heads have movement and that’s where it ends. I understand these are meant to be more ornamental but for me the lack of options gets stale. Not knocking collectors of POPs here, just airing my grievances from one collector’s perspective and my choice to dump my collection. Yeah, I’m really not a fan of their “oh this is retired, but this isn’t” approach. Or how some pops come out of retirement (Friday the 13th), but others don’t (even when seconday market prices demand it or long awaited character set continuations come out – Fruit Brute/Yummy Mummy). I’m curious — how did you do with selling off the collection? Did the Pops! retain their value, make you money, or wish you never wasted your money? I made money on them overall, especially on the MOTU and Thundercats stuff I had. The TMNT POPS were a wash but I didn’t have Bebop and Rocksteady which appear to be in-demand. A few months in and I don’t regret it. I kept Andre the Giant, Robocop, Slimer, and a Pacman ghost but everything else got the boot. I hate them but I also love them. I try not to buy them but I still end up with them. I get the pops that fit into my other collections like the Creature from the black lagoon for my Creature collection. I don not however buy pops for a pop collection. Agreed. Pop! figures are great when included within a collection like this. I have had a few Pop! figures gifted to me — Batman, Planet of the Apes, and a few other superheroes, but I think I’ve only been tempted to buy a Pop! figure once (which was King Kong, of course!). The reason I chose this topic was because of an email I received last week. Someone asked me if he should sell his Game of Thrones Headless Ned Stark SDCC exclusive Pop!, or if he thought the price might go up in the future. This figure can sell for over $1,000 on eBay — a fact that blew my mind — and my advice was to SELL, SELL, SELL!!! I just can’t see a modern toy for a current popular TV series going up higher than this astronomical level in the future. I may be dead wrong, but if it was me, I’d be taking the easy money now. I think Funko is an amazing company and has done more for the collector market than any company out there, I love that they have revived older, obscure licenses, and I’m excited to see what their next offering will be. The Funko line of ReAction figures got me back in the toy stores.. My bucket list includes a trip to the new Funko store they recently opened. Having said that, when I walk into a toy show and all I see is booth after booth of POP! toys, I get a more than little bummed out. We will be seeing these figures at toy shows for years to come. I think that most people are content with one or two, but if you’re hoarding these things thinking they will fund your retirement, well I have a few beanie babies to sell you. That would make a nice debate.Which modern toys are worth investing in? I feel like we’re being force fed POPS!They just keep releasing obscure character after obscure character knowing someone ,somewhere will bite.They’re the bobble heads of this generation.I get sick of seeing them everywhere.I woke up this morning and tripped over a POP! ,and I don’t even own one.I don’t hate them ,but don’t like them enough to buy one. I kind of do feel “forced” to buy things based on the classic Planet of the Apes movies because new items are fairly uncommon. If there were a thousand new items released (Batman ’66 toys) I would be more picky. I’m not sure what modern toys are worth “investing in.” Historically, items become collectible because they were never meant to be collected or saved, whereas today’s toys seem to be made more for collectors than kids. Good point Brian. We are at peak POP right now and if you plan to sell, pull the trigger. Maybe a little speculating but I don’t see these rising much more in popularity and aftermarket price. Cash out folks! Cool that they have so many licenses so a lot of obscure lines are out. Walls and walls of Pops. I always liked the packaging of Mighty Muggs. Wish they would have lasted longer. Overall I’m not a fan. The walls of pops you see at shows can be plain obnoxious. That said I do pick and choose certain ones I like and have about ten in my collection. I go for the characters I feel work in POP form. For example I have Slimer and Baby Groot in the flower pot. I’ve also just seen they’re relseasing an Orko next year which will be a must for me. I guess what I’m saying is I don’t hate them and can appreciate them some of the time lol. Also the new ships w the characters sticking out of the top are kind of neat as well. If a company can sell you ten products, I think that’s a success for them. If I buy ten Marvel action figures, or ten Walking Dead comic books, that seems like I am a repeat customer. I know it probably won’t happen here on Cool & Collected, but I’d love to hear what non-collectors think of Pop! figures. I know they must be buying them too — are they collecting them? I don’t think he’s a POP fan IMO.He’s a fan of 10 characters POP! made. You could like a few songs on a album but not necessarily be a fan of the band.O.K. bad analogy but I think you get the gist. That’s what I mean by Funko kind of shoving them down our throats.They’ll just keep making character after character until they get a bite.It’s a can’t lose strategy. I personally can’t stand the POP aesthetic. I’ve always hated bobbleheads, so the fact that’s pretty much all they are doesn’t do much to endear them to me. I guess it boggles my mind why anyone would want to see their favorite characters made in POP form. I mean, were people really desperate to see Big Bang Theory and Sons of Anarchy POPs? Actually, I’m guessing they weren’t, since I still run into them on clearance in Target. I’ve also noticed a lot of them have some paint issues. I know they’re a mass produced “collectible”, but their design is so simple, you’d think they could keep from smudging the paint on the eyes. In the end, I just think they’re a waste of shelf space. I actually know someone who was seeking out the Big Bang Theory set — that person is not a collector at all, but a huge fan of the show, so it makes me wonder/marvel at the broad appeal of these things. My girlfriend and I got heavy into Pops, and have many of the highly sought after and rather expensive “original” pieces. Of course we were also collectors from the starting gate when most people ignored them. However, once the Pop explosion occurred we really lost interest. There’s simply too many of them to collect now, and what’s more so frustrating is that you can never seem to find a complete set for the brand you want. There are always one or two that you will not find without going to ebay – Which defeats the purpose of collecting. Everyone has an exclusive to sell, yet you can never find them. Pops became like the movie Clerks for us. We loved it when it was back in the day, and nobody knew about it. It was a small crowd of folks who were in the know. Now that EVERYONE loves Pops (or Clerks for that matter), it’s simply not enjoyable. There are too many to collect, too many people collecting them, too many exclusives, and it’s market over saturation. It’s just not fun anymore. We have about 1,000 of them that are literally sitting in boxes in our spare bedroom. The only ones we actively display and still collect are The Walking Dead. We don’t even bother updating our collection tracker on Pop Price Guide (dot com) anymore because we buy so few these days, and honestly just don’t care. Hey Matt, I’m glad you chimed in here since it seems like you are the first true Pop! collector to show up. Are there any Pop! figures that you still hunt for or are you done? Is the Pop! market strong or struggling? What do you plan to do with a room full of these things — buy and hold, sell? Me personally? I’m done. I don’t enjoy collecting them anymore. The thrill of the hunt is dead, and when I do find a set I am remotely interested in it’s either bashed in (box wise) or I can’t find the whole series because half of them are exclusive, or just not readily available. Collecting should be fun, not frustrating. My girlfriend still picks up a few here and there – Mostly The Walking Dead. She swears she is going to go through all the boxes and dwindle down the ones she really doesn’t want…ahhemm – Lemmy Kilmister…But, I guarantee she won’t. They’ll sit there until the market bottoms out, at which point she will kick herself for missing her opportunity while at the same time rejoicing because she can finally get all the ones she wanted for pennies. As for the market – the older ones which were made in far less quantity continue to rise in price which is great if you’re selling or want to boast about the potential value of your collection. However, all the current stuff (unless it’s exclusive) is pretty much stable at retail (or less) prices. I find the only reason the exclusive ones are worth any value is because either they’re severely limited, or the scalpers swoop them up and inflate the price overnight. Of course, you have to blame the collectors who are feeding the scalpers. If people didn’t buy, people wouldn’t scalp. Personally, I don’t think Pops are going anywhere any time soon. The benefit they have as a brand is an ever growing market of pop culture. Unlike Beanie Whatzits, Pop has the benefit of piggybacking on established markets. There is something which pretty much can appeal to everyone. That’s a good niche to have, but it also unfortunately contributes to the massive saturation of the market – Another reason the retail ones are not really worth much…Until they’re retired. Not a Pop collector myself. I won a Rogue One Finn bobble-head that I put on my desk at work. Went to my LCS and they were having a sale, buy two, get one free. I saw a Prince Vultan that I thought was cool. I grabbed that and 10th Doctor (with hand) and got a Stormtrooper bobble-head. They are all sitting on my desk at work. That’s about the extent of my “collection”. I think they are cute decorations but can’t really see the long term collectibility of them. And they booth after booth after booth of Pops at the local conventions and row after row at specialized toy stores as left a kind of a sour taste in mouth.